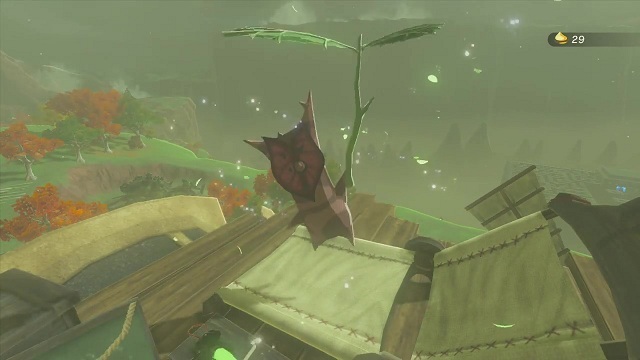 Korok seeds are collectible items in Zelda Breath of the Wild. They’re obtained by finding forest spirits scattered around the world. There are 900 of them, and you can use them to expand your inventory. Since there are so many of them, lots of people simply don’t bother finding them. However, there’s an exploit that can help you have your cake and eat it. After the Master Trials DLC launched, players discovered the Zelda BoTW infinite korok seeds glitch. You’ll have to own the DLC in order to make use of the glitch. You’ll also need to have at least one Divine Beast quest still on the to-do list. Enter the Trial of the Sword, then teleport to the incomplete Divine Beast. Once you’re there, go to the Akkala Ancient Lab, in the northeastern corner of the map. There’s a korok on top of the lab. Once you’ve climbed up and talked to the little feller, go to the edge of the wooden platform and jump up a couple of times. When you approach his lounge chair, he’ll appear again, granting you another seed. You can repeat this until you’re sick of it, or until you’ve got all 900 seeds (there’s a funny reward for it, apart from the extra inventory slots). Now, this is a pretty glaring bug that invalidates one of the bigger challenges in the game. The developers will no doubt patch it up as soon as they can. If you want to make use of it, now’s your time, before the hand that mends makes its move. If you feel like this takes all the fun out of it, but still think finding them without assistance is too hard, you should get the Korok Mask. It’s an item that acts like a sensor for korok seeds, alerting you whenever you’re near one.